6-Shot consumer mortar rack. 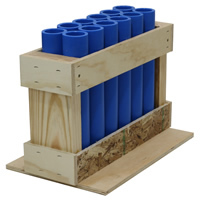 Comes with 6 blue HDPE DR9 12" long mortar tubes. Mortar tubes are plugged. For use with slightly smaller consumer firework mortar shells (festival ball shells). The inner diameter is 1.81" and the outer diameter is 2.4"
12-Shot consumer mortar rack. 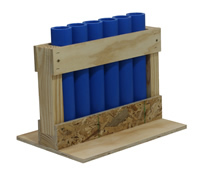 Comes with 12 blue HDPE DR9 12" long mortar tubes. Mortar tubes are plugged. For use with slightly smaller consumer firework mortar shells (festival ball shells). The inner diameter is 1.81" and the outer diameter is 2.4"
18-Shot consumer mortar rack. 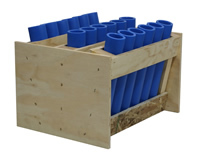 Comes with 18 blue HDPE DR9 12" long mortar tubes. Mortar tubes are plugged. For use with slightly smaller consumer firework mortar shells (festival ball shells). The left and right rows are angled at 15 degree from the center. The inner diameter is 1.81" and the outer diameter is 2.4"
20-Shot consumer mortar rack. Comes with 20 blue HDPE DR9 12" long mortar tubes. Mortar tubes are plugged. For use with slightly smaller consumer firework mortar shells (festival ball shells). The inner diameter is 1.81" and the outer diameter is 2.4"
36-Shot consumer mortar rack. 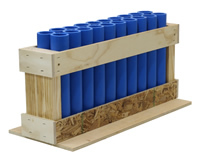 Comes with 36 blue HDPE DR9 12" long mortar tubes. Mortar tubes are plugged. For use with slightly smaller consumer firework mortar shells (festival ball shells). The left and right rows are angled at 15 degrees from the center. The inner diameter is 1.81" and the outer diameter is 2.4"